Make yourself at home in one of the 25 guestrooms. Your pillowtop bed comes with premium bedding. Complimentary wireless Internet access is available to keep you connected. Conveniences include ceiling fans, as well as phones with free local calls. With a stay at Mountain Chalet Aspen, you'll be centrally located in Aspen, a 2-minute drive from Aspen Mountain and 9 minutes from Buttermilk Mountain. This ski hotel is 9.1 mi (14.7 km) from Snowmass Mountain and 3 mi (4.9 km) from Aspen Highlands. With a stay at The Snow Queen Lodge in Aspen, you'll be a 3-minute drive from Aspen Mountain and 9 minutes from Buttermilk Mountain. 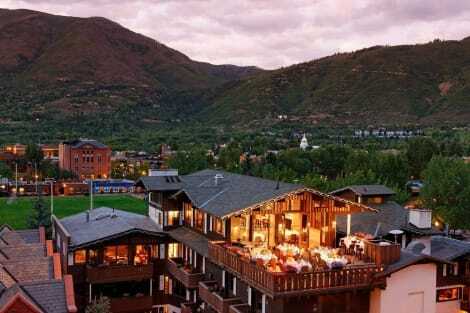 This lodge is 8.9 mi (14.4 km) from Snowmass Mountain and 2.9 mi (4.6 km) from Aspen Highlands. Make yourself at home in one of the 98 guestrooms, featuring kitchenettes with refrigerators and microwaves. Your bed comes with premium bedding, and all rooms are furnished with queen sofa beds. Rooms have private patios. Complimentary wireless Internet access is available to keep you connected. This charming hotel is set in Downtown. This hotel offers a total of 35 rooms. Annabelle Inn is not a pet-friendly establishment. Enjoy the convenience of ski-in/ski-out access at this hotel, which also features a health club and an outdoor pool. This hotel also features complimentary wireless Internet access, concierge services, and ski storage. Make yourself at home in one of the 92 air-conditioned rooms featuring fireplaces and LED televisions. Your pillowtop bed comes with down comforters and Egyptian cotton sheets. Cable programming and DVD players are provided for your entertainment, while complimentary wireless Internet access keeps you connected. Private bathrooms with separate bathtubs and showers feature jetted bathtubs and designer toiletries. When you stay at The Gant - Aspen in Aspen, you'll be near ski lifts, within a 15-minute drive of Aspen Mountain and Buttermilk Mountain. This 4-star condominium resort is 9.5 mi (15.4 km) from Snowmass Mountain and 3.5 mi (5.6 km) from Aspen Highlands. lastminute.com has a fantastic range of hotels in Aspen, with everything from cheap hotels to luxurious five star accommodation available. We like to live up to our last minute name so remember you can book any one of our excellent Aspen hotels up until midnight and stay the same night.